On the surface, this was the third consecutive solid jobs report, not as measured by the typical recovery, but the best back-to-back reports we have seen for years. The Payroll Survey Establishment Data showed employment up by 244,000. At that pace of hiring, the unemployment number would ordinarily drop, but not fast. 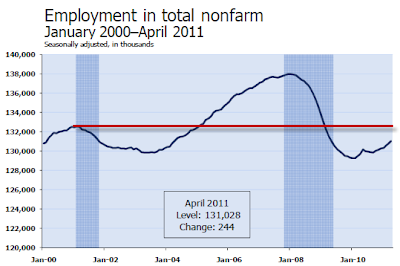 Instead, the unemployment rate ticked up. The reason is beneath the surface, employment fell by 190,000 according to the Household Survey. According to the Household Survey, the number of unemployed rose by 205,000. Another 131,000 dropped out of the labor force or the unemployment rate would have been even higher. It is hard to say on one month's data. However, during a recovery the household survey is supposed to lead. Moreover, the household survey is more consistent with three recent reports. Non-Manufacturing ISM Plunges Below Prediction of All 73 Economists, New Orders Collapse, Prices Firm; Did Rosenberg Capitulate at the Top? 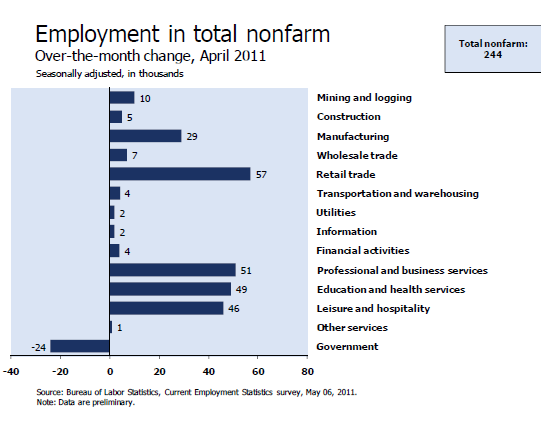 Last month I said "It is very questionable if this pace of jobs keeps up." Well, it kept up if the Payroll Survey is correct, it sure didn't if the Household Survey is to be believed. Digging deeper into the Household Survey, we see some more interesting data. In the last year, the civilian population rose by 1,817,000. 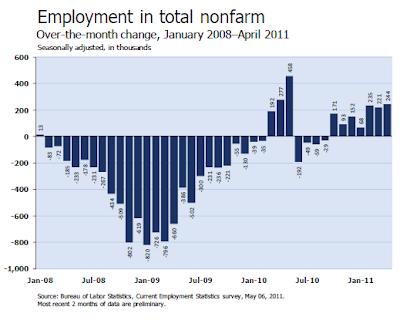 Yet the labor force dropped by 1,099,000. Those not in the labor force rose by 2,916,000. In January alone, a whopping 319,000 people dropped out of the workforce. 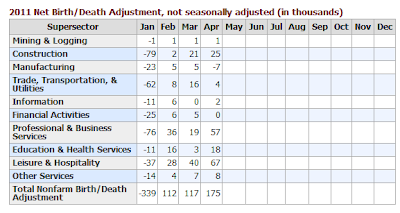 In February another 87,000 people dropped out of the labor force. In March 11,000 people dropped out of the labor force. In April, 131,000 dropped out of the labor force. 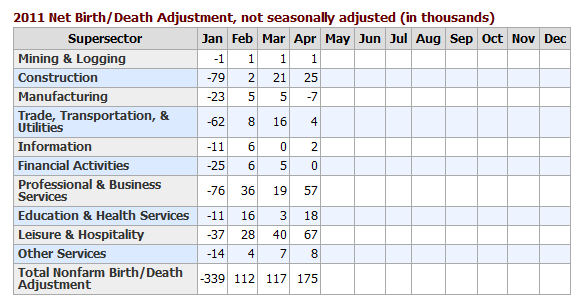 The 4-month total for 2011 is 548,000 people dropped out of the labor force. Many of those millions who dropped out of the workforce would start looking if they thought jobs were available. Indeed, in a 2-year old recovery, the labor force should be rising sharply as those who stopped looking for jobs, once again started looking. 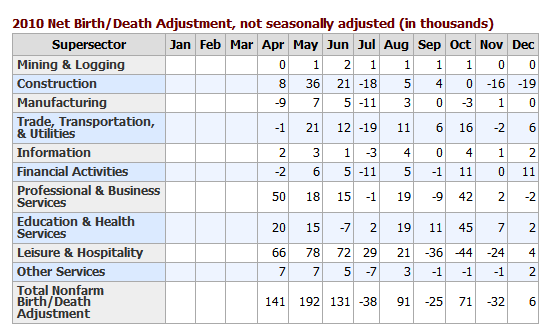 Instead, an additional 548,000 people dropped out of the labor force in the first four months of the year. As I said, the report looks good on the surface, it does not look good if you poke around in the details. 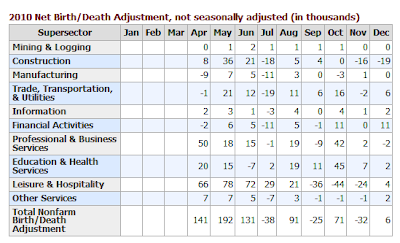 Please consider the Bureau of Labor Statistics (BLS) April 2011 Employment Report. Nonfarm payroll employment rose by 244,000 in April, and the unemployment rate edged up to 9.0 percent, the U.S. Bureau of Labor Statistics reported today. Job gains occurred in several service providing industries, manufacturing, and mining. 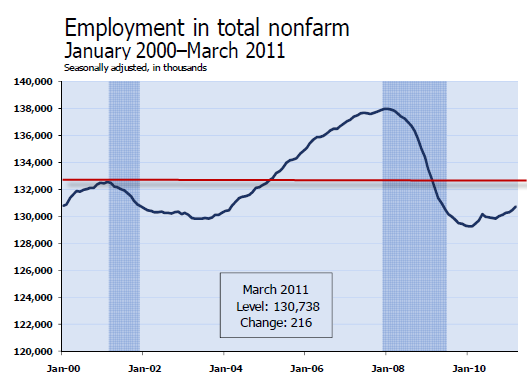 Notice that employment is lower than it was 10 years ago. 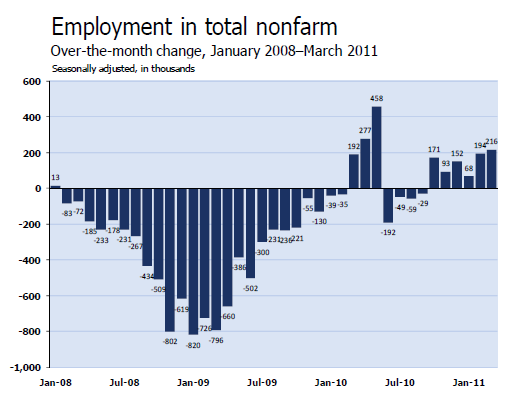 Employment in the private sector rose by 268,000 in April. Since reaching a low point in employment in February 2010, the private sector has added 2.1 million jobs—an average of 149,000 per month. In April, the average workweek for all employees on private nonfarm payrolls was unchanged at 34.3 hours. The average workweek for production and nonsupervisoryemployees on private nonfarm payrolls was also unchanged at 33.6 hours. The index of aggregate weekly hours for all employees rose by 0.3 percent over the month. 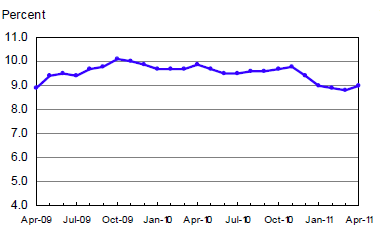 Since reaching a low point in October 2009, the index has increased by 3.3 percent. 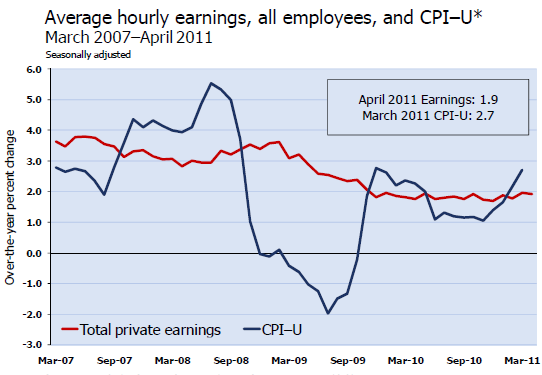 Average hourly earnings of all employees in the private sector increased by 3 cents in April to $22.95. Hourly earnings are up 1.9 percent over the year. 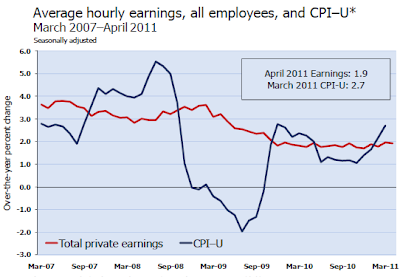 Between March 2010 and March 2011, the consumer price index for all urban consumers (CPI-U) increased by 2.7 percent. 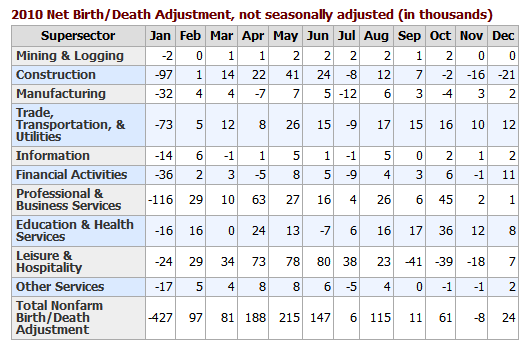 The big news in the BLS Birth/Death Model is the BLS has moved to quarterly rather than annual adjustments. Effective with the release of January 2011 data on February 4, 2011, the establishment survey will begin estimating net business birth/death adjustment factors on a quarterly basis, replacing the current practice of estimating the factors annually. This will allow the establishment survey to incorporate information from the Quarterly Census of Employment and Wages into the birth/death adjustment factors as soon as it becomes available and thereby improve the factors. It is possible that the BLS model is now back in sync with the real world. Moreover, quarterly rather than annual adjustments can only help the process. Inquiring minds note enormous backward revisions in Birth-Death reporting. Is this new model going to reflect reality going forward? That's hard to say, but things were so screwed up before that it is unlikely to be any worse. One encouraging sign is several negative numbers in the recent chart. January would have been negative too, had they shown it. Historically there were only 2 negative number every year, January and July. That anomaly broke November of 2010. Do NOT subtract 175,000 from the headline number. That is statistically invalid. In the last year, the civilian population rose by 1,817,000. Yet the labor force dropped by 1,099,000. 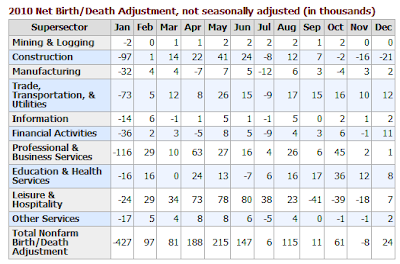 Those not in the labor force rose by 2,916,000. There are now 8,600,000 workers whose hours may rise before those companies start hiring more workers. The official unemployment rate is 9.0%. However, if you start counting all the people that want a job but gave up, all the people with part-time jobs that want a full-time job, all the people who dropped off the unemployment rolls because their unemployment benefits ran out, etc., you get a closer picture of what the unemployment rate is. That number is in the last row labeled U-6. While the "official" unemployment rate is an unacceptable 9.0%, U-6 is much higher at 15.9%. Things are much worse than the reported numbers would have you believe, and this month's report was exceptionally weak beneath the surface.